We’re seeing the results of this across many product categories. Manufacturers have got things dialed down to a near science. The result is a nearly-identical product template that’s stamped out by almost every company on the market. 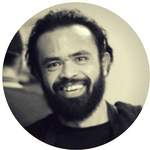 You see the same phrases when you look at product specifications and marketing material. 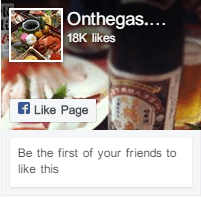 Reviews simply indicate that all of the products work. So how are you supposed to choose? One factor that you can use to distinguish from a sea of near-identical products is branding. Even if two cookware sets are very similar, the quality assurance offered by one company might make their products a much smarter buy. A better customer service network can help solve any defects or problems you encounter after you’ve used your cookware for a few weeks. Finally, some brand names carry enough weight that they’re worth paying a little bit of extra money for. Just like actual Jordans are more impressive than a knock-off Nike, name-brand cookware will help show your houseguests that you’ve got the good stuff. We’ve looked at all of these factors and more in order to help you choose between Calphalon and Cuisinart. 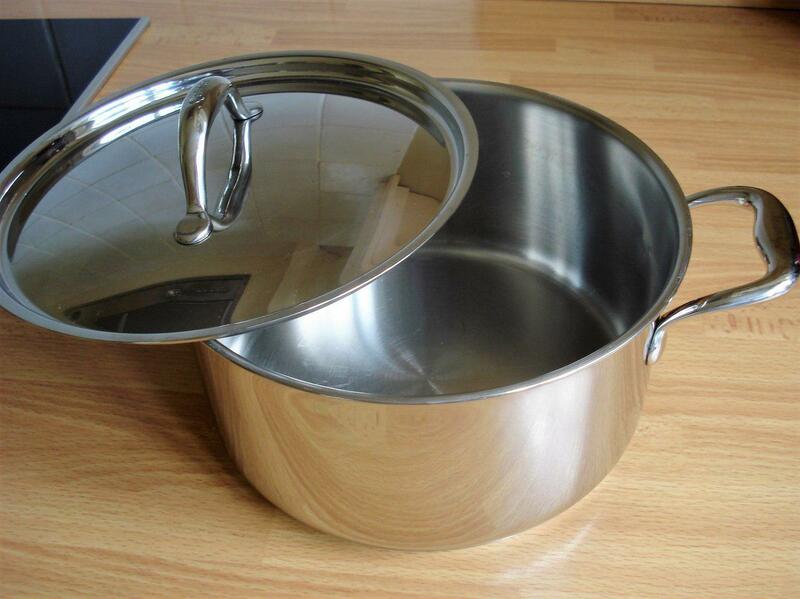 The following reviews cover some of the very best cookware sets you can find from both companies. Read on to learn more about which cookware set will perform best in your kitchen. This stainless steel cookware set will last in your kitchen for years. While most brands are going for a full multi-clad construction these days, this Calphalon set features aluminum bases and stainless steel sides. This means that it’s a bit cheaper, but it theoretically has worse heat distribution up the sides of the pots and pans. Does this matter? No. You don’t cook food with the sides of your pots. In your pans, it matters even less, since you can simply nudge food off the walls and stir it to ensure that everything heats up evenly. The aluminum bases do a great job of distributing heat throughout the bottom of each pot. The only way that these pots and pans lose to tri-ply competitors is if you try to cook using the actual side walls. One incredibly nice feature of this set is the addition of fill lines on the inside of the pots. You can measure liquid without using any additional tools. This makes cooking soups, stews, and sauces very easy. The lids on this set are made of glass and feature steam vents to keep them from rattling. It’s oven safe to pretty much any temperature you’re likely to cook at, especially if you remove the lids. Finally, the pots have pour spots that line up with strainer holes on the lids. This means that you can pour out a sauce without making a mess or even strain pasta or vegetables without a colander. This is definitely one of my favorite cookware sets as far as features are concerned. If you want a durable steel cookware set with pretty much every feature you could ever want, this Calphalon classic stainless steel set is an amazing choice. 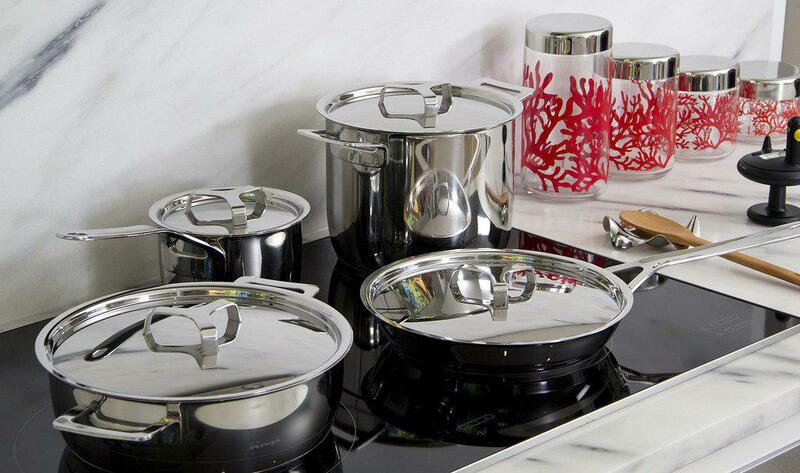 Cuisinart’s Multi-Clad Pro line is a popular choice that rivals some of the most storied cookware on the market. It’s a fantastically solid set that features steel lids and a full multi-clad design. While it’s not as feature-rich as the Calphalon set above, it’s still a better fit in some kitchens. There are several important differences here. First, while the Calphalon set has stainless steel sides, the Cuisinart MCP line is fully tri-ply. This means that the side walls of your pots and pans have an aluminum core. This is certainly not necessary for heat, but it is nice to know that your water might boil a little bit faster because heat travels up the side walls of your pans. In other words, it’s a very slight upgrade. Second, the lids on this cookware set are made from metal. 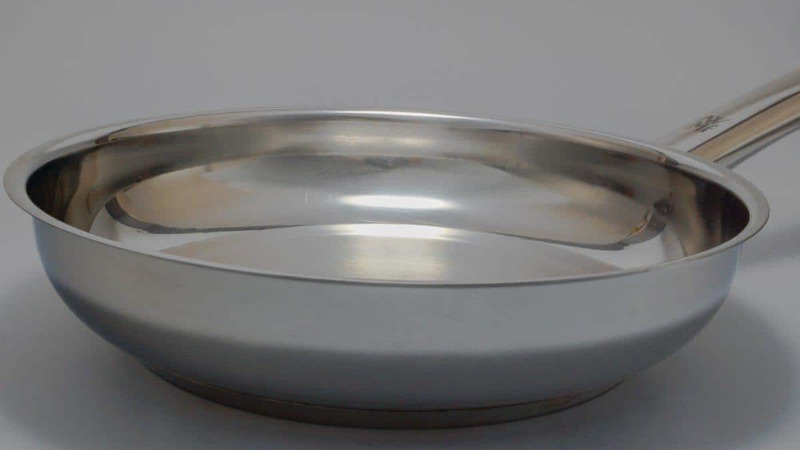 If you’ve got kids or you think your housemates might clumsily drop your cookware lids, steel is definitely a better choice. Even if you know you’re going to be careful, consider how long you’ll have this cookware. Stainless steel will last for decades. Over a twenty or thirty-year timespan, are you really going to avoid accidentally breaking a single glass lid? While there are no measuring lines, strainer holes, or steam vents in this cookware set, there are drip-free rims that help with easy pouring. The lids fit very well. Just like the Calphalon set above, this cookware set is oven and dishwasher safe. Brand considerations aside, I think that this set is a slightly better choice if you want your cookware to last for a really, really long time. It’s also ostensibly faster at boiling water, although I doubt you’ll notice a difference in practice. If you prefer the Cuisinart brand or you’d like to ensure you don’t ruin your cookware set by breaking a glass lid, this Cuisinart set is an excellent choice. With similar products like these, one of the questions you should be asking yourself is “is Cuisinart a good brand?” The answer here is “yes.” Both Cuisinart and Calphalon are industry giants with a storied history of delivering excellent products. Sure, both companies occasionally put their names on products that flop, but for the most part, Cuisinart tools and cookware perform excellently. Similarly, Calphalon has been a driving force in the cookware market for many years. While they’re best known for their anodized cookware, they’ve offered high-quality products in other styles for quite some time now. But what about quality assurance and customer support? There’s no clear winner here. Both brands have an excellent reputation and do a very good job keeping their customers happy. Better yet, both brands have very long warranties (lifetime limited) on most of their cookware sets. If you want a product with great manufacturer support, both Calphalon and Cuisinart are excellent brands to buy from. 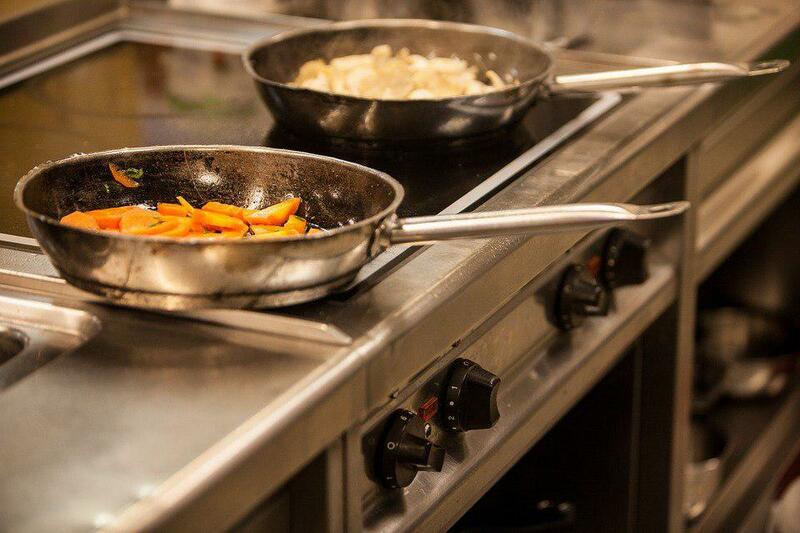 Both Cuisinart and Calphalon make cookware in a variety of styles. Calphalon, for example, makes both a “classic” and a “contemporary” line. The difference between Calphalon classic vs contemporary is one of materials, at least as far as the stainless sets are concerned. The “classic” line uses aluminum bases and stainless sides, while the “contemporary” line features full tri-ply construction. It’s otherwise very similar. Calphalon is best known for making high-quality anodized cookware. So why isn’t it reviewed here? The answer is simple: non-stick pans don’t last. These days, pretty much every anodized pot or pan you can find has a non-stick cooking surface. This means that it’s going to stop being fun to cook on that pot or pan after a few years of use. If you want something that’s going to last, choose one of the stainless sets above. This isn’t to say that non-stick sets aren’t worth buying. If you want to get one, however, check out some of our other reviews HERE. The term “multiclad” and the term “tri-ply” effectively mean the same thing. Both terms refer to the practice of sandwiching an aluminum core between layers of steel. Aluminum is used due to its excellent heat transfer, low weight, and fairly low cost. Steel is safe to cook on, non-reactive, easy to clean, and very strong. This combination is found in nearly all modern cookware with a stainless steel cooking surface. Calphalon Vs Cuisinart: The Best Brand? 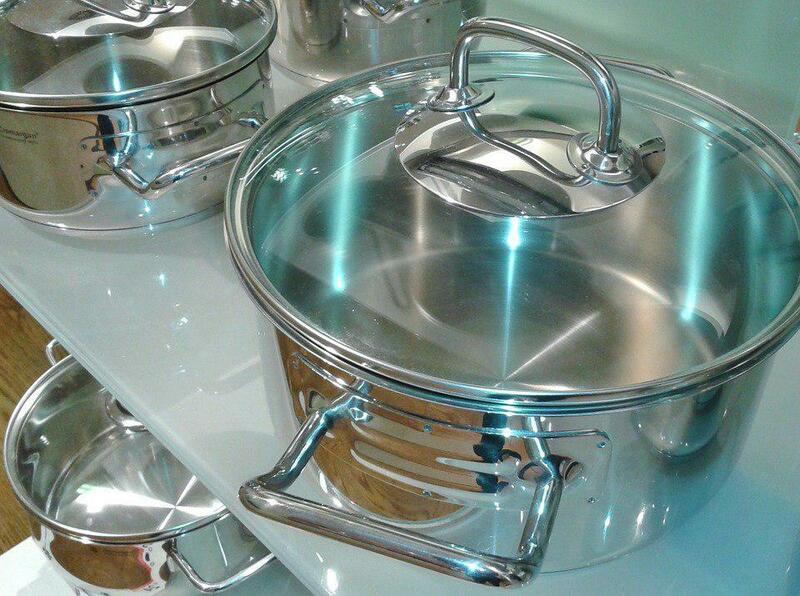 Cuisinart is best known for making tools, while Calphalon has a long history of making anodized aluminum cookware. So who makes the best cookware sets today? The answer? Neither. Both brands have excellent quality assurance and customer service programs, and both make very high quality cookware in more than one style. Personally, I’m inclined to lean towards the Calphalon Classic line, but that’s because I’m a sucker for low cost, high-durability cookware with lots of extra features. Cuisinart’s MultiClad Pro line is arguably a bit more durable, however, and is a strong competitor to much more expensive All-Clad lines. In other words, you can’t really go wrong by choosing either.